We are really proud of this Pigskin Wings recipe because it showcases all of our talents here at Hungry Fan. First and foremost, our culinary genius — bacon wrapped wings, need we say more? Mix the salt, pepper, cayenne pepper and garlic salt together in a plastic bag. Place half the chicken in the bag and shake well until the chicken is coated in the spice mixture. Put the coated chicken in a 9″x13″ baking dish, without overlapping any pieces. Repeat the coating process with the other half of the chicken. Once all the chicken is fully coated, use your soaked toothpicks to wrap a single piece of bacon around each wing and return to the baking dish. Repeat for all wings. 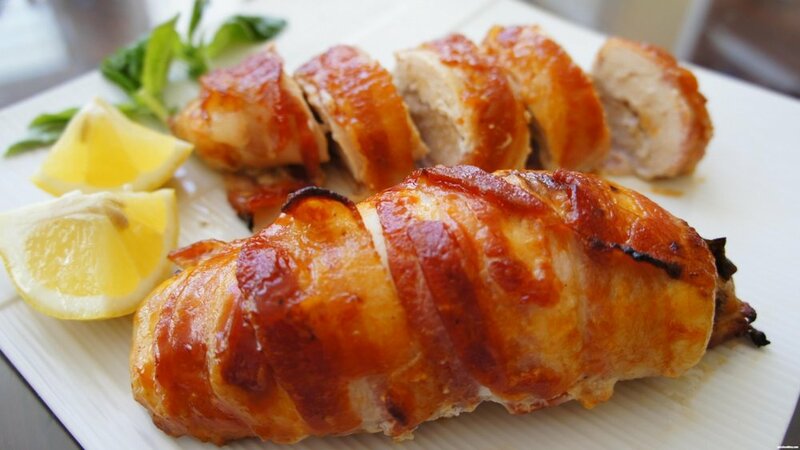 Bake chicken for 15-20 minutes. (You can test doneness by seeing if the juice from the chicken is clear). Remove from oven. Let the wings rest for 10 minutes then coat in Blitz sauce (see below). Serve! Using a food processor, mix all ingredients together. Add in up to 2 additional tablespoons as needed if sauce consistency is too thick.